A new report by a prestigious polling firm says that a so-called ‘No-Deal’ WTO-style Brexit will cost one EU country €5.5 billion over the next two years, as opposed to a Brexit with a trade agreement where losses for that country would likely total €1.5 billion over the next two years. That country is the Republic of Ireland. 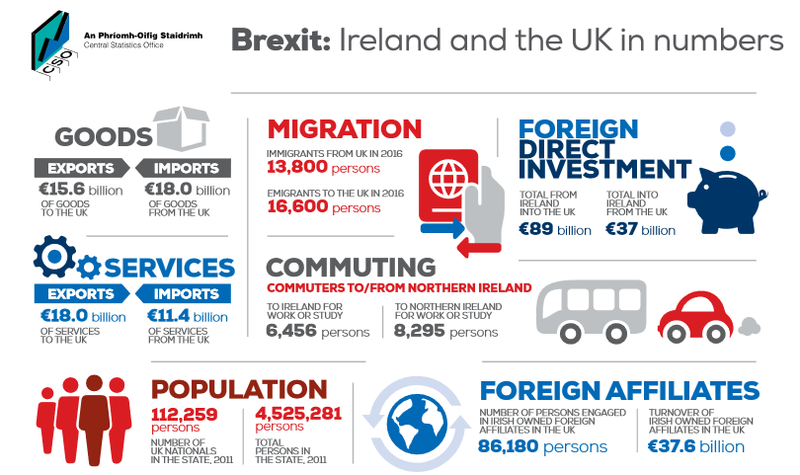 “A hard Brexit could cost the Irish economy more than €5.5 billion over the next two years, a government-commissioned report has said. A “soft” Brexit including a transition arrangement would cost less than €1.5 billion over the period, highlighting the importance to Ireland of the UK’s withdrawal talks with the EU. The study by Copenhagen Economics, which examined four possible scenarios, also warns that the UK will probably take at least five years to implement new trade agreements, complicating Irish efforts at contingency planning. [Ireland’s ‘Taoiseach’ which is the official title of the Irish Prime Minister] Leo Varadkar said last night that a comprehensive free-trade deal with the UK would be the best way to avoid a hard border. After a meeting with Theresa May, the UK prime minister, he said: “We both prefer [the option] by which we can avoid a hard border in Ireland, and that is through a comprehensive free trade and customs arrangement. We can extrapolate that other EU countries would also take an economic hit in a ‘No-Deal’ scenario, but due to their much larger economies when compared to Ireland, such losses would amount to tens or even hundreds of billions over the same two-year period. Just think of all those German cars that wouldn’t be sold in the UK due to the higher tariffs that would automatically be imposed on EU countries in a ‘No-Deal’ Brexit! So if country A and country B decide they want to trade, they’re completely free to build a better tariff structure than the comparatively expensive WTO ruleset, and that agreement will thenceforth supercede the WTO tariff structure. However, it only applies on trade between those two countries — the rest of their trade with the world would still be conducted under the auspices of the WTO. It’s a pretty basic thing. Countries that do anything more than a smattering of trade between them negotiate bilateral free trade agreements to bypass the more onerous WTO trade rules and tariff regime. As of this writing there are 409 days remaining until Brexit and either we will have a trade agreement with the EU, or we won’t. If not, it will be costly for both sides, but more costly for the EU by one order of magnitude! However, saying that there are 409 days remaining ’til Brexit — isn’t the same as saying there are 409 days left to negotiate a free trade agreement. Far from it! The two sides have 258 days to arrange a free trade agreement. Let’s hope our politicians (and theirs) are up to the job (and if not, why are we paying them?) otherwise almost everything that citizens and businesses purchase will become much more expensive on both sides of the English Channel in the post-Brexit timeframe. UK Prime Minister Theresa May has said repeatedly that October 29, 2018 is the latest both sides can agree a trade and customs deal before they must begin to get ready to implement WTO trade rules. And on that point both sides agree. In fact, even a preparation time of five months (during the period from October 29, 2018 to March 29, 2019) would barely suffice to put in place the necessary measures and standards to allow industry to prepare for life after Brexit. Both UK and EU voters should remember who did, and who didn’t, get a free trade agreement signed when they head to the polling booth at the next election. Thanks to the dedication of thousands of people, the problems that plagued Northern Ireland for decades have all but disappeared. While we mourn those lost during ‘The Troubles’ we must move forward and provide the best possible future for the people of Northern Ireland and the Republic of Ireland. The best way to continue to move forward is for a ‘soft’ border between Northern Ireland and the Republic of Ireland so that the free movement of people and unimpeded trade may continue along the 310 mile border. Many people on both sides of the border meet for tea, travel across the border to shop, or are employed on the other side of the border and it would be unfair to require these people to face a regular border crossing twice daily. And a hard border would definitely hinder trade, which trade is a vital part of the local economy along both sides of the divide. The smartest thing the Home Office UK Visas and Immigration department could do is to create a separate queue line at all UK ports of entry and mark it “Commonwealth and Ireland” so that people from Commonwealth countries or from the Republic of Ireland have a dedicated and streamlined entry into Britain. In this way, goods and people can move much more efficiently between those jurisdictions. If it sounds like I want to favour people from Commonwealth nations, you’re right. If it sounds like I want to favour people from Northern Ireland who may decide to fly to Britain, you’d be right. And if it sounds like I want Republic of Ireland citizens to easily travel to any part of the UK, you’d be right in that assumption. Here in North America, citizens who cross the U.S. / Canada border can apply for a Nexus Card or an Enhanced Driver’s Licence — either of which dramatically speed border crossing times for holders of those cards — and not incidentally, also lowers wait times for the people in the non-Nexus lineups because fewer people (or vehicles) are traveling in that particular queue — it’s a bonus for frequent travelers in North America. Such a streamlined customs experience should be extended to all Irish citizens as a courtesy — and for the Republic of Ireland in exchange for their help in patrolling and securing the soft border with Northern Ireland. “The UK government pledges to protect the Belfast Agreement and Common Travel Area in new position paper published August 16, 2017. 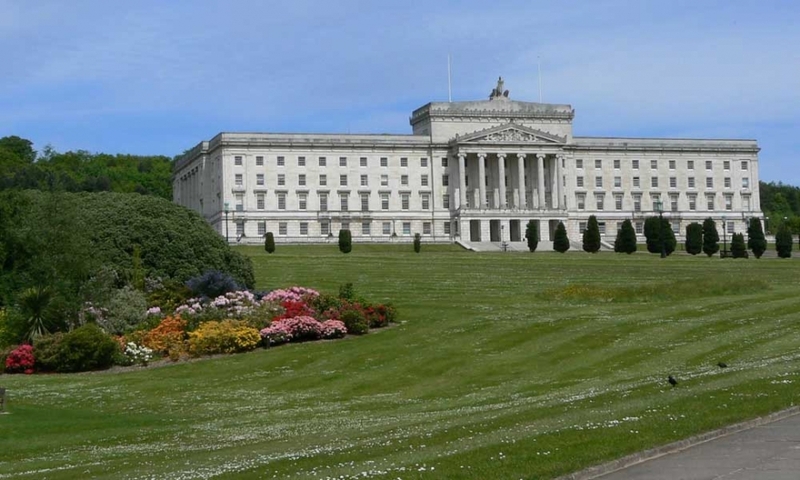 The Government has today published a comprehensive paper which outlines the UK’s position on addressing the unique circumstances of Northern Ireland and the land border with Ireland. The position paper — which has been published ahead of the August negotiating round — states that the Government will protect the Common Travel Area (CTA) and associated rights for UK and Irish citizens, and put upholding the Belfast (‘Good Friday’) Agreement at the heart of its Exit negotiations. 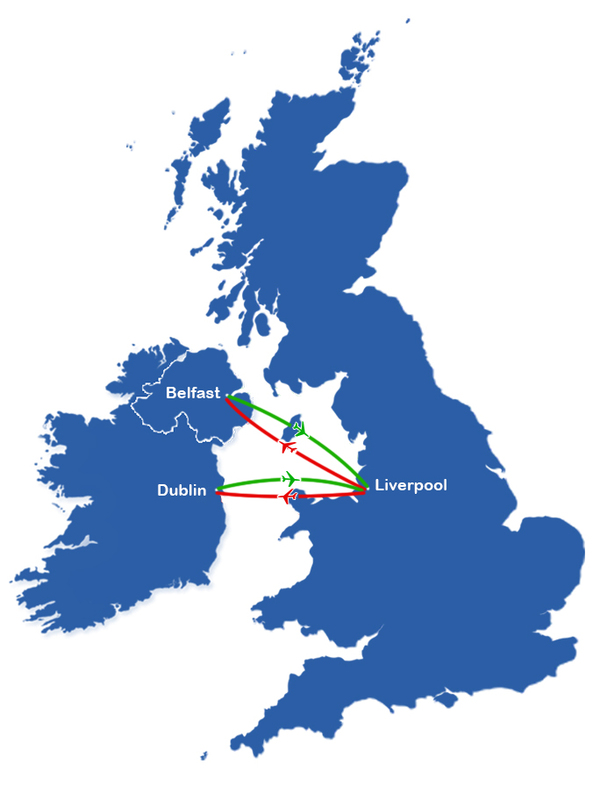 Billions of pounds sterling in trade crosses between the UK and the Republic of Ireland and a significant amount of it is spent in the small and medium-sized business (SME) trade. Keeping the border open, yet enhancing security will be a challenge for both the UK and the Republic of Ireland, but with good will and some visionary thinking it shouldn’t be too difficult to get an agreement that benefits the largest number of people. For as long as the Republic of Ireland remains a member of the European Union it’s in everyone’s best interests to keep the soft border arrangement and to work together to enhance security on both sides of that soft border by any reasonable means. If that means having facial recognition technology and vehicle license plate readers at all government buildings and properties, ferry terminals and international airports in Northern Ireland and Britain, it’s a small price to pay to preserve and enhance security for the EU, for the Republic of Ireland, and the UK including Northern Ireland. The soft border between Northern Ireland and the Republic of Ireland must work for citizens of each country, for small (and large) business, and it must ensure a high level of security for both the EU and the UK. This is one Brexit negotiation that must succeed for the benefit of all.